If you're anything like us, you'll be rushing to the cinema to see Detective Pikachu when it hits the big screen in May. If you've watched any of the trailers, you'll no doubt recognise Ryan Reynolds' voicework as Detective Pikachu. The playful and sarcastic nature of his personality which worked so well in Deadpool is likely to serve Detective Pikachu as well, although we can safely assume there are less F-bombs this time around. The movie would no doubt have felt quite a bit different (for better or worse) had Danny DeVito been given the role, as this petition with over 50,000 supporters demanded. Speaking to Game Informer, it has been revealed that DeVito's voice was used in test screenings by taking dialogue from existing movies, and it went down rather well. It was really very funny, so I couldn’t speak to all the reasons why it wasn’t Danny DeVito cast. I love Danny and some point maybe after the movie comes [out], we can share those early tests. It’s absolutely hilarious. Detective Pikachu producer Cale Boyter said they had given serious consideration to casting DeVito and “how it might inform the spirit of” the upcoming movie, but it just wasn't on the cards, it seems. We had to look at everything, including what fans weren’t seeing yet, to make the decision. But the spirit of Danny DeVito, I promise you, is still inside of Pikachu. Let us know if you think Danny DeVito would have been a better choice for the voice of Detective Pikachu than Ryan Reynolds with a comment below. Oh, and if you're wondering about that image at the top of the page, allow us to clear your mind (don't watch this in a public space, by the way). Ryan Reynolds is supremely overrated. I won't see the movie either way, but Danny would have been my choice. The contrast between his raspy old man voice and Pikachu would have added a lot more character I believe. @KennyBania Opinion is noted. I think his voice would have been great but I liked Ryan Reynolds and his humor seems like a good fit so I'm excited. Was looking forward to the "Always Sunny" references in Detective Pikachu, too bad Danny DeVito did not materialize. Now I can't stop imagining a movie with two Pikachu's, one voiced by DeVito, the other by Reynolds. Their interactions would be golden. That headline makes me extremely uncomfortable. You could say he's a spirit! 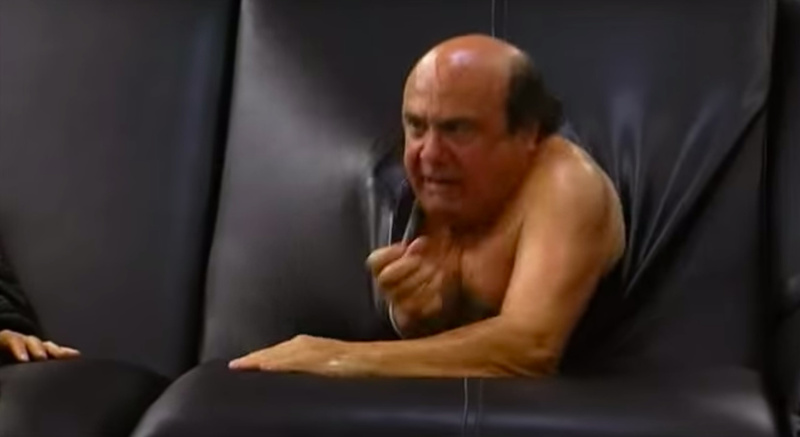 Danny devito confirmed as a secret legendary spirt in smash bros ultimate! They did it for marketing. Pure and simple. Ryan Reynolds is a more recognizable name. It still looks funny, but it will be different for sure. More FLETCH, less COLUMBO. Sorry but that headline + that Image + an image of Detective Pikachu + photoshop skills = by far the worst, most disturbing image I've seen in a while. Oh god....now I can't get it out of my head. Danny Devito IS in the Pokemon movie. He's under the Pikachu suit. Although I was thinking of the giant inflatable Pikachu in particular. Prior to the 1st trailer I was in the DeVito camp, but that's mainly because I played the 3DS game so I had the voice pre-set in my head. After hearing Reynolds voice with Pikachu's action, it grew on me fast. Both give D. Pikachu that pumpkin spice latte I like. The writing also play a role. They only choose Reynolds because he's popular as Deadpool, that's all. DeVito is a much better actor. You guys sometimes get unfairly accused of clickbait, but this is pretty cut and dry. The headline strongly implies he's in the movie, leaving out the crucial "spirit" bit. The thumbnail just mite be my favorite episode of Sunny. Either one would have worked well, but in very different ways. I'm glad I'm not the one to have to make the choice. "Speaking to Game Informer, it has been revealed that DeVito did record many of the lines in the movie as a test to see how it would pan out." "VFX producer Greg Baxter says he and his team took lines from assorted actors’ past roles and animated an early version of Pikachu to the audio to see how it looked. Danny DeVito was one of the actors they did a test for." DeVito did NOT come in just for a screentest. Might wanna fix that. With older people like myself, Devito would have been a good fit, but with the younger generation, Reynolds was a better fit. When casting for a movie, you have to look at what audience would arrive for it and who is up for that audience. However, to play the lead (non-animated) actor, I would have picked someone else. At least someone that is recognizable. Other than that, I don't think the movie looks good even though my kids will want to see it, so a 'no go' in the theaters, possibly on video, but other than that, not holding my breath for a hit...too many other movies that look good coming out this year (very few). Not thinking the Sonic movie will be good either...video game movies are a hit and miss, I don't think Assassin's Creed, Need For Speed, Warcraft or Rampage did that well either (could be wrong), and I know the last Tomb Raider flopped. Only ones I really enjoyed (as an entertainment value) were Silent Hill (not the awful sequel), Super Mario Bros (for Leguizamo and Bob Hoskins), Mortal Kombat (when it came out, it was enjoyable and funny with a good actor...Christopher Lambert...just a bad looking Goro and awful sequels) and...well, that's about it for me. To me, some would have to have good visual effects directors and great directors for them to do good, and the plots seem to get messed up, the art direction gets messed up, the actors are horrible in most and the movie comes out with bad timing...never put it out with another movie that you know will be a bigger hit with audience members and expect it to do good. Why does everyone (including this article writers) keep asuming that Ryan Reynolds "is likely to work well" or "might work well" as Detective Pikachu? I get everyone is just sharing their opinion in the matter but at this point saying that he will do a "horrible job" or just straight up shooting him down just cause, is plain ignorant bias! Ryan Reynolds has already fully proven himself to be an excellent voice for that character and the movie Deadpool has absolutely nothing to do with it, is like comparing Captain America with The Human Torch! I think another reason that Ryan may have gotten picked was because Ryan creates a Pikachu that's better-geared towards younger audiences. Not only is Ryan familiar to younger audiences, but Ryan's voice in the Pikachu role adequately conveys an overly-confident and strong-willed character that still lines up with the sort of "saccharine" tone of the Pokémon series. DeVito's voice would have portrayed a wild, unpredictable, goofy Pikachu, and I don't believe that is Detective Pikachu's behavior. That said, I hope the creator comments are true and furthermore that Detective Pikachu's personality and scripting is the result of a mashup of work from both Danny and Ryan. Ryan can shore up Danny's tangents, references, and over-wackiness (that, again, doesn't appeal to current audiences). Danny's acting history and chops can add depth and life to the character where Ryan's presentation can come across as corporate or "sterile." Though I hope the DeVito test recordings come as a Blu-Ray extra. Danny De Vitto is a fine actor but I cannot understand why so much publicity over this actor and Pikatchu. The actor that they have now, Reynolds, is an extremely good choice. They could do a part 2 where there's an evil detective Pikachu voiced by Danny DeVito. That would be one way around this. I definitely would love to hear a Danny DeVito detective Pikachu voice lol. @Shift I'll get that corrected right away! @ilikeike You gotta pay the troll toll to get in the Pokemon's soul..? When I first saw the movie trailer I figured one of the twists of the movie. When you all see it you'll know exactly why DeVito wasn't cast. Love the choice of the picture. "Is there a guy in that couch!" If you get the option to cast Danny Devito you always cast Danny Devito. Man is hilarious. The only reason they Chose Ryan Reynolds is because of his name, nothing else. It had nothing to do with how well his voice fits. In fact any open casting call for voice talent would have resulted in a better fit than him. I'm sorry, I don't hate him, but he is a commodity now, not to be seen for talent, but as a brand to draw people in. Danny Devito's voice was funny because it is the polar opposite of cute fuzzy pikachu, and Reynold's doesn't channel any of that attitude from what we've seen, its just him speaking like himself, which just sits in a lukewarm area that sounds off. It also snubs the VO for detective pikachu in the game too. This movie is going to be one for the books. I still think DeVito's voice would have fitted better. Some people won't quite get this but the fact he is a smaller guy actually makes the sound of his voice fit the smaller character of Pikachu better in this case, imo, whereas Reynolds' sounds more "manly" and big and doesn't quite match Detective Pikachu tonally. Reynolds' should still be very good in the part though. The sound may not be perfect but the attitude should be solid. I can't wait to see the unused dialogues from Danny Devito on the Blu Ray! That type of stuff is probably my favorite part about seeing a new movie. Especially after the credit rolls leaving you wanting more.